Dutch physician and economist; born at Amsterdam Jan. 31, 1813; died there June 23, 1866. After finishing his medical studies at Leyden (M.D. 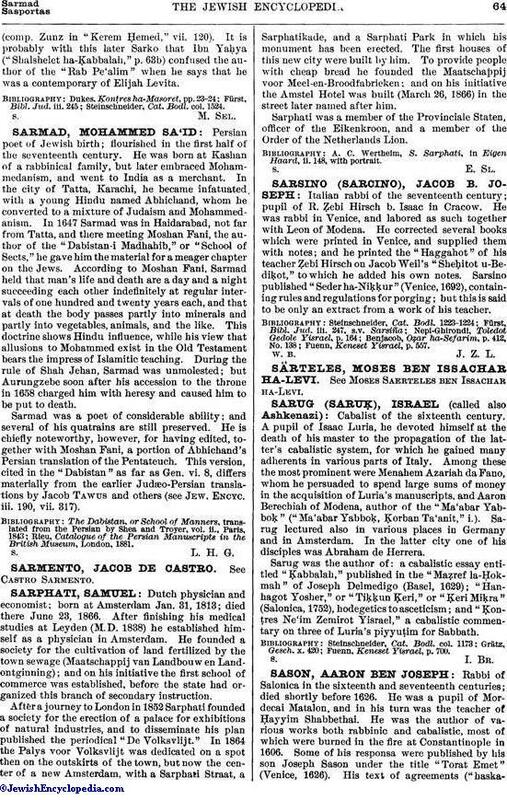 1838) he established himself as a physician in Amsterdam. He founded a society for the cultivation of land fertilized by the town sewage (Maatschappij van Landbouw en Landontginning); and on his initiative the first school of commerce was established, before the state had organized this branch of secondary instruction. After a journey to London in 1852 Sarphati founded a society for the erection of a palace for exhibitions of natural industries, and to disseminate his plan published the periodical "De Volksvlijt." In 1864 the Palys voor Volksvlijt was dedicated on a spot then on the outskirts of the town, but now the center of a new Amsterdam, with a Sarphati Straat, a Sarphatikade, and a Sarphati Park in which his monument has been erected. The first houses of this new city were built by him. To provide people with cheap bread he founded the Maatschappij voor Meel-en-Broodfabrieken; and on his initiative the Amstel Hotel was built (March 26, 1866) in the street later named after him. Sarphati was a member of the Provinciale Staten, officer of the Eikenkroon, and a member of the Order of the Netherlands Lion. A. C. Wertheim, S. Sarphati, in Eigen Haard, ii. 148, with portrait.